today's fat tuesday, the day before ash wednesday, otherwise known as mardi gras in new orleans and anywhere else people need an excuse to party and overeat. of course, being a quarter of the way through my cleanse means that i can't derail the effort i've put into getting this far. which means no king cake. no seafood gumbo. no jambalaya. no crawfish etouffee. no po-boys. no beignets. no fun. and did i mention that it's also national pancake day at IHOP? which is on my way home from work? and i can't have those pancakes, even if they're FREE?? welcome to my mardi maigre (lean tuesday) celebration. any gluten-free, dairy-free, vegan version of any of the above still won't work on the reset self cleanse i'm on, only because they'll probably still have sugar, tofu, and/or salt. or some hidden ingredient from which i'm supposed to be abstaining. but instead of dwelling on what i CAN'T eat, i made myself focus on what i CAN eat: fruits and vegetables in all forms (fresh, dried, juiced, pickled, cooked, and raw), herbal teas, kombucha, and to a lesser extent, beans, seeds, and whole grains. i started with an apple (again) for breakfast, then a green salad (again) for lunch. by late afternoon, i was climbing the walls with a major munchie craving. 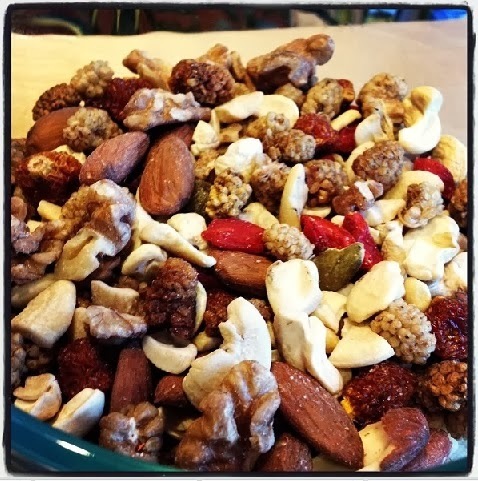 my boss reminded me that i could have some trail mix as long as it was just fruit and nut, so i walked to the whole paycheck up the street and splurged on an half pound assortment of superberries (goji, golden, maqui, and mulberry), raw cashews, sprouted almonds, and sprouted walnuts. i threw them all together in a bag and commenced munching. of course, the need to snack had pretty much passed by then, so i ate less than a handful of the mix and stashed it away for the next time a mid-day craving hits at work. i also was given a coupon for $1 off a bottle of suja juice by a sales rep when i walked in the store, so i treated myself to a bottle of their fiji blend, made of cold-pressed fuji apple, cucumber, celery, kale, spinach, collard greens, lemon, and ginger juices. note to self: this brand is way too pricey to become a regular habit. unless, of course, it goes on sale. like half off, preferably. speaking of drinks, the liver tonic has this way of making me want to pee constantly (i know, TMI, but this IS a cleanse, after all). does this mean i've been retaining all this water? or does this mean all the food i've been eating is primarily water? or both? today's yoga class: a gentle warrior flow (per my request - thanks, adam!) with adam schomer at sattva yoga. and yes, i went to yoga class instead of going to the local IHOP. woohoo! !